Arrhythmia Treatment. The physicians at Atrial Fibrillation Center Of America pride themselves as being advocates for patient needs and have established their practice as an example of the highest quality arrhythmia care available. Arrhythmia Treatment. Our mission is to develop strong patient-doctor clinical relationships to be able to deliver the best possible personalized care. Arrhythmia Treatment. We believe our patient services are the finest available and offer the following. Arrhythmia Treatment. The doctors may recommend improved lifestyle habits such as stopping smoking, limiting consumption of alcohol, eliminating some activities if they are contributing to arrhythmias, reducing the intake of caffeine, and eliminating stimulants such as those found in cough medications. These changes may significantly improve a patient’s heart irregularities and can also contribute to improved overall health. There are many medications available for treating arrhythmias. These include: beta-blockers and other anti-arrhythmic drugs to control heart rates; anticoagulants and antiplatelet therapy drugs to reduce the chance of blood clots and strokes; and blood thinners, also to reduce clotting. The principal surgical procedure used for arrhythmia is catheter ablation. During this procedure, a thin wire with an attached device is inserted into the heart through a vein. Once positioned at the source of erratic electrical signals, the device removes or destroys tissue which results in isolating the cells causing the excess signals. Several types of devices or approaches are used to separate the erratic firing originating in the pulmonary vein from the rest of the heart muscle. Isolating the malfunctioning site reduces or eliminates the random electrical signals causing the arrhythmias. A radio frequency device is used to heat the tissue at the mouth of the vein, killing the tissue. The destroyed cells form scar tissue which does not conduct electricity and serves to isolate the points in the vein causing the random electrical pulses. A device called a ‘cryoballoon’ acts to freeze the pulmonary vein tissue and results in scarring. This scar tissue blocks the transmission of the erratic electrical signals being produced in the vein. Under certain conditions, patients with a-fib are at risk of suffering a stroke. A contributing factor in the origins of stroke is blood clots forming in the left atrial appendage of the heart. One approach to solving this problem is the use of a Watchman device. This device is an umbrella-like appliance surgically placed at the mouth of the appendage. Over time, this appliance is overgrown by heart tissue and effectively blocks the pooling of blood in the appendage area thereby reducing clotting and its associated stroke risks. The physicians at Atrial Fibrillation Center Of America take pride in being highly skilled at using the catheter ablation procedures to correct many a-fib issues. Also, at ACA, we use high-tech 3-D mapping technology to guide the procedure which eliminates or reduces the need for exposing the patient to x-rays. Not only does this help improve procedure results but also reduces the patient risk from harmful radiation. 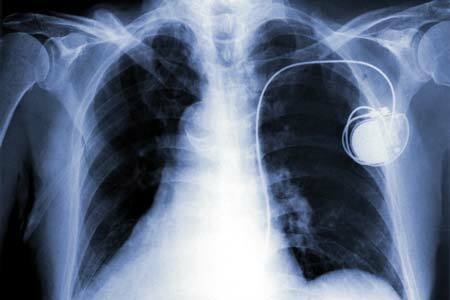 Pacemakers are small electronic devices that are battery driven and computer-controlled and are used for monitoring and regulating heartbeats. The devices are surgically implanted just under the skin near the collarbone with wires leading and attached to specific muscles in the heart. These are often used speed up a heart that is beating too slow but can also be used if a patient’s heart rate is sometimes too fast. Most pacemakers contain a sensing mode that prevents the pacemaker from firing until the heartbeat is irregular. So long as the heart is beating normally, the pacemaker remains dormant. If the heartbeat slows to an abnormal rate, however, the pacemaker sends an electrical signal to the heart which stimulates the muscles causing the heart rate to increase. In other cases, pacemakers work by continuously sending an electrical signal to the heart muscle causing it to contract in a regular and properly timed sequence. The signal from the pacemaker acts on the heart muscle in the same way as the natural electrical signals. 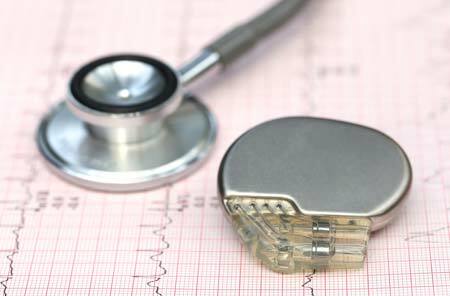 Individuals with pacemakers need to be cautious when around certain electrical equipment such as electric arc welders, MRI equipment, and certain security monitoring devices. This equipment and others produce strong magnetic fields that can interfere with the operations of the pacemaker. These devices can be an excellent solution for certain individuals based on the type and severity of their arrhythmias. Your physician at Atrial Fibrillation Center Of America will discuss any possible application of pacemakers based on your needs. Implantable cardioverter defibrillators (ICD) are similar to pacemakers and in some recent versions do the same jobs. ICD’s are implanted devices with wires leading to the heart. These wires conduct electrical signals that regulate the heart’s contractions. While pacemakers also function in this way, ICD’s are also able to monitor the heart whether or not the lower chambers of the heart are fibrillating (ventricle fibrillation or VF) and deliver a strong electric shock to bring the VF to a halt (cardioversion). As high tech electronics develops, the pacemaker and ICD’s will likely be combined into one device.